Funko is back with a huge rollout for Marvel's next big screen adventure Captain Marvel, which stars Brie Larson as one of the MCU's most powerful heroes. Carol Danvers gets quite a few individual Pops, but perhaps most exciting to fans is the inclusion of Goose the Cat. These toys also reveal that co-star Jude Law isn't playing Mar-Vell as expected. He's actually playing Yon-Rogg. Funko isn't just getting down and dirty with a truck load of Captain Marvel Pops. They are also offering pen toppers and keychains, for what is sure to be another Marvel blockbuster. These fun items will all be available January 2019, with the movie set to hit theaters on March 8. So fans will have a full two months to get their Carol Danvers action on behind the couch before they live it out in real life at the local cineplex. One of the Funko Pop toys has Carol on her fancy new motorcycle, and for Dorbz fans, there are quite a few of those collectibles as well. The Captain Marvel Funko Pops are already available for pre-order. You can secure yours at Entertainment Earth. 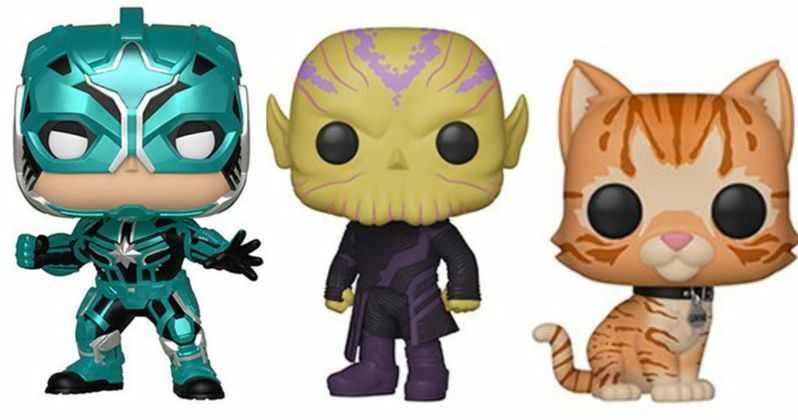 Some of the new Captain Marvel Funko Pops will only be available exclusively at different outlets, which has become a signature of the Funko Pop line, which actually makes it quite challenging for some fans to find and collect all of them, and the coolest figures are usually the hardest to locate. You'll have to hit up Target on a regular basis if you really want that Flying Captain Marvel figure, and Walmart is the only place you can get the Glowing Captain Marvel. Vers is only being shipped out to GameStop. And perhaps the coolest Pop of all, Goose the Cat Flocked variant is only going to be showing up a BoxLunch. FYE will have the Carol Danvers exclusive, and you'll have to brave the cold goth world of Hot Topic if you want to add that Captain Marvel with her jacket Pop. Yes, when it comes to Captain Marvel, Marvel and Funko are certainly keeping fans on their toes with a Scavenger Hunt only the biggest fans will want to embark on. Others will just settle for their generic Captain Marvel Star Commander figure, which will be available everywhere. Marvel Boss Kevin Feige has previously confirmed that Carol Danvers is the strongest superhero in the MCU, and her Funko Pop line-up backs that up. The movie finds Earth caught in the middle of a galactic crisis, as two alien races go to war. Captain Marvel is the only one that can save humanity, as the action plays out in the year 1995, when Funko Pops didn't exist, and their signature Bobble Head line was but a glimmer in the eye. With Captain Marvel, fans will be treated to a corner of the Marvel Cinematic Universe they've never seen before. Anna Boden and Ryan Fleck are directing Captain Marvel from a screenplay written by the collaborative team of Meg LeFauve, Nicole Perlman, Geneva Robertson-Dworet, Liz Flahive & Carly Mensch, along with Anna Boden & Ryan Fleck. Dang, that's a lot of fingers in the stew, but it sounds like they've managed to pull off the next great adventure in the MCU. You can check out the new Funko Pops here.